Lyon - On Thursday we can expect sunny weather. On Vigilance Météo you will find current weather data, local weather forecasts and a treasure of useful information around weather. Thanks to our high-resolution weather radar and current severe weather warnings there will be no nasty surprise any more. Along with large parts of Europe France is located in the so-called temperate zone. But that does not mean that the weather here is uniform all over. West and North France are affected by the Atlantic Ocean which provides plenty of humidity and rather moderate temperatures. That leads to mild winters and moderate summers. Frontal systems, as can be watched in our clouds-precipitation film, can be found here more often than in any other part of the country. 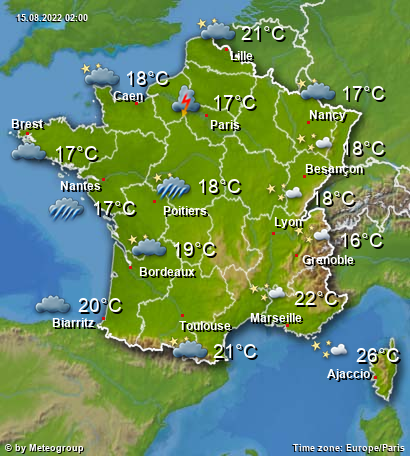 Central France is characterized by a continental climate. This region is dryer than any other part and the moderate influence of the Atlantic ebbs away with each kilometre further into the interior. This can be clearly seen in the film of currents. So this region has colder winters and hotter summers. And the sun is shining here more often than in northern parts of the country. The Massif Central and the Alps occupy an exceptional position due to their altitude. That means winters are stronger here, whereas temperatures in summer remain comfortably fresh. The Mediterranean climate prevails in Corsica and South-East France: Summers are very hot and dry, whereas in spring and autumn a surge of heavy rain events can be observed. But, thanks to early severe weather warnings, there are no surprises anymore. Speaking of severe weather, in this region, often the infamous Mistral holds away, which is a very strong and unruly wind! So not only sailors and campers will value our Mistral diagrams.